And so does their daughter, as continually and as instinctively as we all reach for water, this reaction being a prime example! Go with it. I saw this sign/meme several times, and never knew what to say, because my first reaction was “I know what that means.” Right down in my bones. I felt it perfectly when I read Dinner at the Homesick Restaurant, and The Ladder of Years, and The Things They Carried, and more, I’m sure. There is more than one kind of True Fiction, I feel, and I know I will come upon more of it yet. Letting myself use this knowledge gets me to a place where my own memoir-y work becomes better, and truer, too. Nice post, Shelley. I stand by my original statement that this sign bothers me, although I was, indeed, being humorous when I posted it — largely because it didn’t occur to me that anyone would find it an appropriate genre delineation. The very definition of the word fiction is something (in literary terms, a work of prose) that is false, imaginary, or untrue. To team the word fiction with the word true is to create an oxymoron. I would disagree that a roman a clef novel is true fiction. It’s a novel with a key; a work of non-fiction that uses a cipher to disguise it as a work of fiction. If that sounds like true fiction to other people, then that’s all well and good and more power to them. But the term still bothers me, in much the same way that the term ‘raw toast’ would bother me. I think I have much broader definitions of what constitutes writing than many writers I know and certainly broader than many industry experts. I don’t really compartmentalize writing until I absolutely have to. For all the same reasons I encourage writers to write their vision, not somebody else’s. 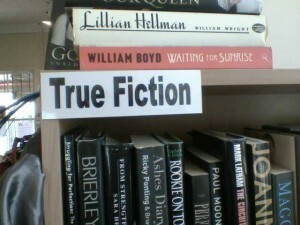 There is, as Exploding Mary said for herself, something untroublesome to me about the seeming oxymoron of a category called True Fiction. True Fiction is something I can feel in my body and therefore it could be true, even were I to wrap the definition of a roman a clef into as tight a coil as you propose. Perhaps it’s because I believe all fiction is true on some level, even when the premise is entirely made up. Because it attempts to explore a question or a topic, or way of entertaining ourselves, that is real to us. So, yes, I really wouldn’t have a problem with a label on a bookcase that read True Fiction. Even if I didn’t believe any of the books on that particular case were able to live up to the category. I’m glad you wrote this. (Maybe. It depends on those hidden motives.) I remember the post about the sign. I’m fairly sure I didn’t comment, so I didn’t see the way the thread played out. I felt I was supposed to be bothered by the sign, and I can see Jo’s point of view. Sure. Fiction=not true. And as such, true fiction is silly. But as me and what I like to write and to read, I have no trouble with the label true fiction. I struggle with many writing labels, and I resist ascribing a label to my own writing. It’s unfortunate (in my view) that I have to tell people a category. I didn’t comment on Jo’s post because I didn’t want to make fun of the sign and I didn’t want to defend it. So, I’m pondering hidden motives now. Truth is relative. There is no absolute truth. Labels and genres are very useful for comparing and contrasting but can constrict the creative process. There is truth is all fiction and fiction in all truth (or, as my mother would say “the truth lays somewhere in the middle”). My life is a true fiction, as it were, and that’s a good enough title for my autobiography, should it ever be written. Tangentially, I was so pleased to view that clip of Maggie Smith as Myra Arundel in Hay Fever. I just finished typing the text word for word. I guarantee you she and her scene partner played the scene exactly as it was written and yet it is alive in ways that one can not perceive by merely reading it. It is an exquisite example of how the best dramatists write scenes that contain an ineffable vitality that shines in the hands of gifted directors and actors. What you say about how the best dramatists write scenes that come alive in the hands of gifted actors and directors is what makes theatre such a fantastic vehicle for what Brian Eno called Scenius. It has nothing to do with senior citizenship (in case you were wondering). It was always the thing that stoked me when I worked as a director, how the actor breathed life into the words of a great play. It wasn’t something that happened overnight, as you know from your own directing and acting experiences. And now your experience working with actors as a playwright. That’s interesting, don’t you think? That over time words on a page, which represent a larger vision of emotion and action in the playwright’s head, an actor and director draw the invisible part of the play out of the words and stage directions and make them visible. It’s where fiction and reality intersect and fuse to create something beyond itself, in the minds and emotions of the spectator, or audience. Theatre is a full contact sport.